It’s no secret that I love drinking my greens. I recently shared my go-to recipe for green smoothies -also known as the holy grail of green smoothie recipes. 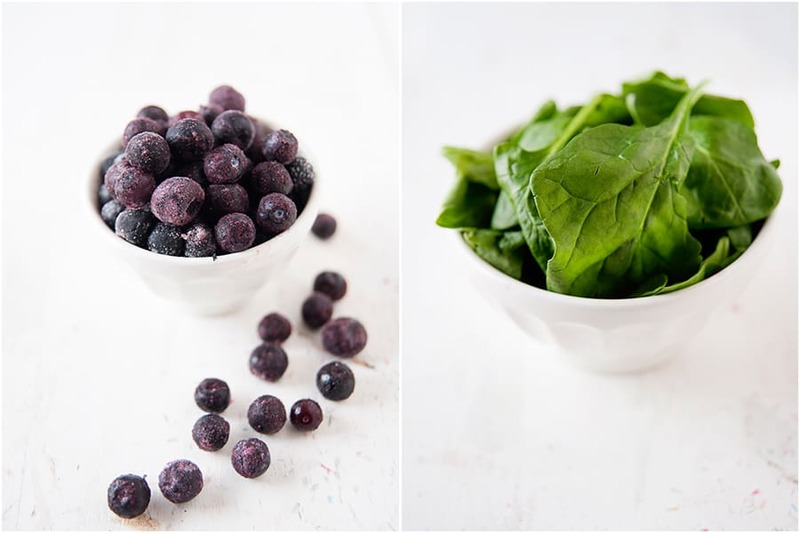 Once you try it, you’ll see that spinach doesn’t have to taste leafy at all! Let’s face it, we are all very busy and eating our daily serving of veggies can often get put on the back burner. There are so many delicious food options out there that our stomachs often fill up with other things -myself included. I love food but I don’t love salads -unless they are the kind where the lettuce is an afterthought. Not to mention, who wants to eat a big bowl of salad every day for lunch? Not me!! As you can see from my Instagram feed, I like to eat lots of other things for lunch – and rarely do they include a salad bowl. One reason I love smoothies is that they are perfect for my busy mornings when I don’t have a lot of time to eat. Most mornings I’m in a hurry to get out the door with 3 kids that sitting down to eat does not fit into our routine. That said, one can’t go on an empty stomach all morning -especially mornings where I go straight to the gym after I drop off the kids and before going to the office. 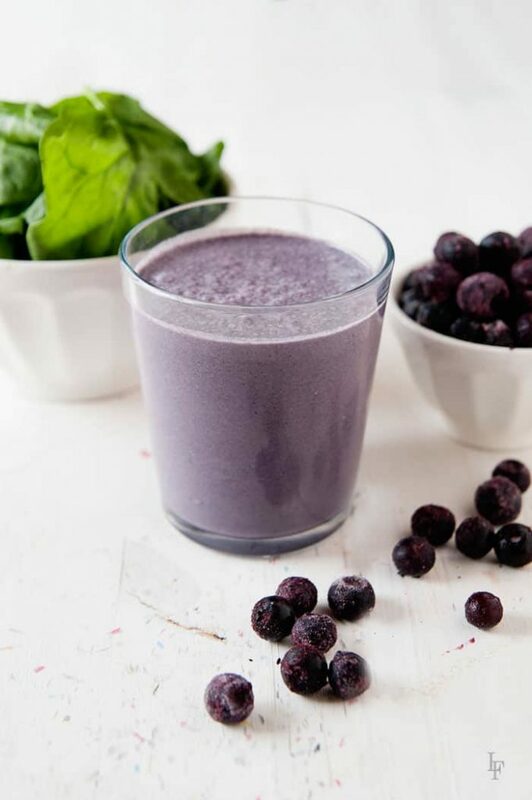 I love that this smoothie reminds me of my favorite blueberry muffins and blueberry scone recipes. And, the best part is that I can put all of the ingredients in my blender the night before and store it in the fridge. In the morning, all I have to do is blend, pour in a to-go cup, and I’m good to go! Recipes like this one and my Berry Smoothie with Yogurt totally get me going in the mornings. This recipe is one I usually drink on days that I will be working out. It’s perfect because it’s heavy on the protein, which is essential when you are working out to help repair your body, plus it keeps me full so I’m not thinking about food while I exercise (at least I try not to). 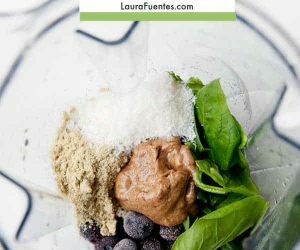 I prefer to use the vanilla flavored protein for this recipe -actually, it’s the base for most of my recipes. In my opinion, vanilla goes well with every flavor. Back to the smoothie. From time to time I “eyeball” it and make extras. That means that my 3-year-old gets his share of greens as well. He’s my smoothie buddy. 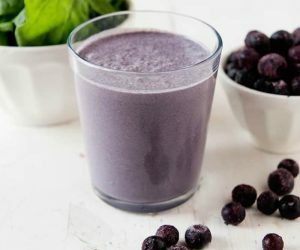 If you are having trouble getting your kids to drink “green” smoothies, this is one “purple” smoothie worth trying. I hope you enjoy this simple recipe as much as I do. Getting started drinking your daily green smoothie is simple and can be painless with delicious recipes like this one. And, doing something that makes you feel good -like eating the right foods, exercising, recharging, meeting friends, reading a book… are all great things to live a good life. This delicious recipe will help you drink your daily glass of greens -guaranteed. 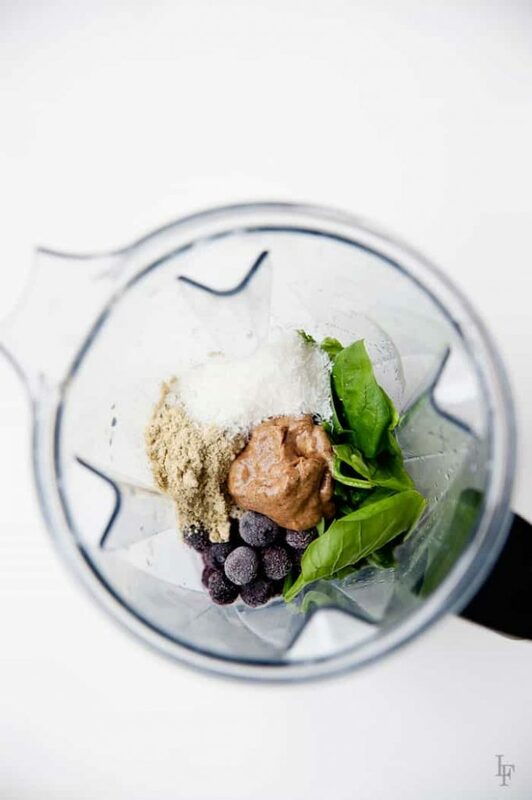 Add all ingredients inside a blender in the order listed. Blend until smooth. Want to get started with a basic green smoothie? 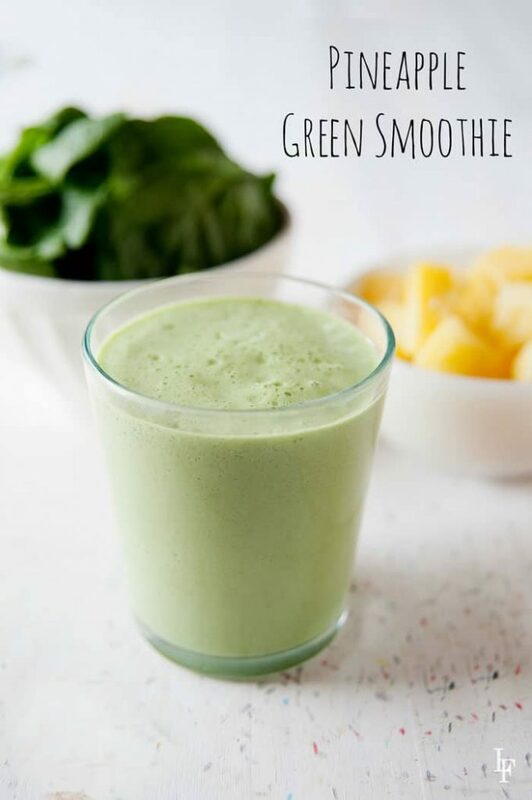 Try my Pineapple Green Smoothie. Full of deliciousness and zero leafy taste. From time to time, I work with awesome companies to develop recipes for this website. Today’s post was brought to you by Vega One. All opinions are 100% my own. Thank you for supporting the brands that encourage my creativity. When does this code expire? Yum! No coconut flakes and just original almond milk and still tasted amazing!! Hello, Love your recipes! Is that Vega One Protein ok for kids? I often give my kids some of my shake with the protein without issues. However, if you are making them a smoothie I would cut back the amount of protein. Enjoy! How is the texture of vega one? Is it grainy once blended?